Mom has read this story to me every Christmas for as long as I can remember. There used to be a lot of words I didn’t know the meaning of and there still are some that I have trouble with – words like “velocipede” and “circumstance” – but not so many now that I’m older. 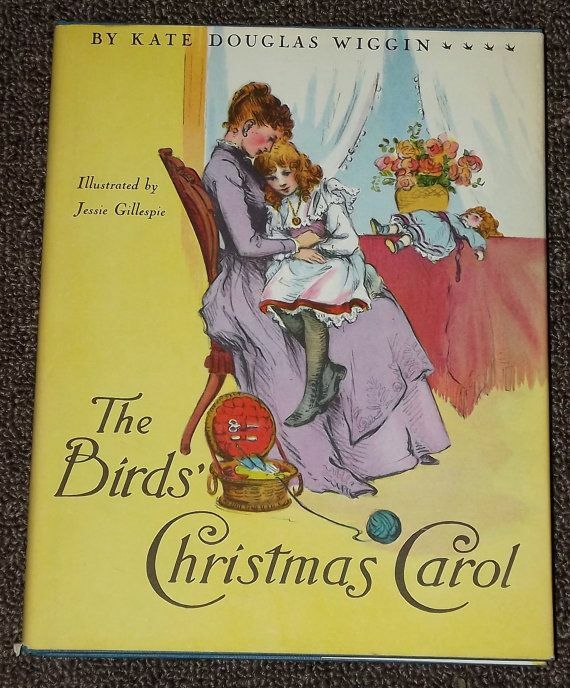 I love it when Mom reads any story to me, but this one is my favourite, partly because it takes place at Christmas, which I love, and because I admire the little girl in the story so much. Mom likes reading me this story. I used to worry when Mom cried during the story-telling, but not so much any more. I know she is crying, not because she is hurt or sad herself but, because the story is sad in parts. Tears prick behind my eyes sometimes, too, and I get a lump in my throat. I don’t think I could talk if I had to, because of it. Warm from my bath and in cozy flannelette pajamas, I snuggle beside Mom, my cheek resting against her soft dressing gown that smells faintly of lily-of-the-valley. Mom sets down her steaming cup of tea on the table beside the green loveseat that we’ve settled into and switches on the lamp. We are in an island of light. She slips an arm around me, picks up the little blue book, and opens it. Handwriting inside the cover reads, “To Carole from Uncle Bill and Aunty Rose.” I am sure they gave this book to my big sister because she has the same name as the little girl in the book. My sister’s name isn’t spelt the same, though; my Carole has an “e” at the end of her name and Carol Bird doesn’t. But both my sister and Carol Bird were named because they were born in December, the month of Christmas – my sister on December 7th and Carol Bird on Christmas Day itself. Mom turns the pages until she comes to a picture of Carol Bird, so pretty with her long golden hair falling in fluffy curls about her face. Although this is a black and white drawing, I know her hair is golden because further on in the book there is a coloured picture of her. There aren’t many pictures in this book and most of them are black and white, so I have to use my imagination a lot. Sometimes I close my eyes so I can imagine better, but I don’t want to fall asleep and miss the end of the story like I did once. I had to wait a whole year to hear the story again from beginning to end. I look at the printing and can’t imagine ever being able to read all those hard words without having to sound them out. It was easy to imagine Carol Bird nestling close to her mother just as I was nestling close to mine. Maybe Mom is imagining the same thing. As she continues reading, her voice trembles and grows softer. I know without looking that her cheeks are wet with tears. In December, ten years after she was born, Carol decided, “I am going to try and make somebody happy every single Christmas that I live, and this year it is to be the ‘Ruggleses in the rear.’” The Ruggles had a brood of nine children who lived in a little house behind the Birds’ back garden. Nine children! I can’t imagine having nine children living next door. My friend Bonnie lives next to me. I remember the autumn day in 1951 when my family moved to Dunbar Street and I first saw Bonnie. I was standing on my back porch and Bonnie was standing on hers. She called over to me, “What’s your name, little girl?” I may have been “little” like she said but, as it turned out, I was seven months older. I was in grade one, but Bonnie wouldn’t be starting school for almost a year. There was a sing-song in her voice when she said her name was “Bonnie-Ta-Julie-Jang.” “Four names!” I thought. It was a long time before I learned that “Ta” wasn’t a separate name but the last syllable in “Bonita,” her proper name. Bonnie will be my best friend, forever, I think. The Ruggles family was poor and couldn’t afford to buy all the food and clothing, let alone Christmas presents, which Carol’s family could afford. The children felt honoured to receive an invitation to a dinner party at the Birds’ Nest and even enshrined it in an old photograph frame. Mrs. Ruggles wanted her nine children to make a fine impression on this special occasion, fixing up their clothes and hair as best she could and making sure the children knew how to behave properly. Minding your manners and remembering to say the right things aren’t always easy when you’re a kid. Even when you know how you’re supposed to behave, sometimes you just can’t. I sure didn’t last week when I went to Bonnie’s place for dinner. Bonnie greeted me at the door and handed me a pair of Chinese slippers to wear, as usual. Those slippers are too big for my skinny little feet, and even curling my toes doesn’t help keep them on. They slap, slap, slap, behind me. When Bonnie and I were waiting for dinner and dancing around as we often do, I kicked my leg up and my slipper flew straight off my foot and into a bowl of spinach. In spite of Mr. and Mrs. Jang’s stern looks, Bonnie and I couldn’t stop giggling all through dinner. We would try not to giggle but, every time we thought about the slipper in the spinach or even looked at one another, we’d smile and the giggling would start all over again. My stomache and cheeks have never been so sore! Back at the Birds’ Nest, the Ruggles children enjoyed a big turkey feast unlike any they had ever eaten before. Afterwards, Carol presented everyone with gifts – practical clothes as well as something for fun – purchased with her own money. When the clock chimed nine o’clock, it was time for the Ruggles children to return home, their faces aglow with the excitement of the evening. Carol lay tired but contented in her bed with the window and shutters slightly open so that she could hear the church choir sing Christmas carols before she drifted off to sleep. It wasn’t ten o’clock yet. The boys’ choir had just finished singing “Carol, Brothers, Carol” and then the boy soprano sang. “Perhaps it was something in the tender thrill of the voice, or in the sweet words, but there were tears in many eyes, both in the church and in the great house next door. “The end.” Mom closes the book and looks down at me with a small smile. “I see you managed to stay awake for the whole story this year,” she says. With the back of her hand she brushes away a tear that had dampened her cheek and one that had traced its way down mine.